Triumph & Disaster Old Fashioned Shave Cream was created to remind us that shaving is a skill passed down from generation to generation and as such, a thing of true value, like a good piece of advice. Give yourself some proper ‘You’ time and enjoy an eclectic wet shave that will leave your skin feeling refreshed and hydrated. Triumph & Disaster Shave Cream delivers a great shave without the any of the nasties we now frown upon. Rich in natural oils and active agents this best-selling shave cream gives a natural glide on the surface of the skin, producing a crisp clean shave with any style of razor. Each stylish-looking tube also gives over 90 shaves. Our carefully selected expert blend includes coconut oil extracts, organic compounds and fatty acids which together act as surfactants, reducing surface tension and allowing the water and oil components of the cream to combine creating a perfect lather. This action softens bristles and prepares the hair follicles, allowing the blades to glide even closer to the skin and create a super-smooth freshly shaven look, just like in the barber’s chair. Unique aromas of old school medicinal notes, bright, fresh citrus tones and a hint of Turkish barbershop at the back end, evoke a sense of tradition and nostalgia befitting a gentleman’s morning ritual perfectly. Use with the Triumph & Disaster Shave Brush for best results. 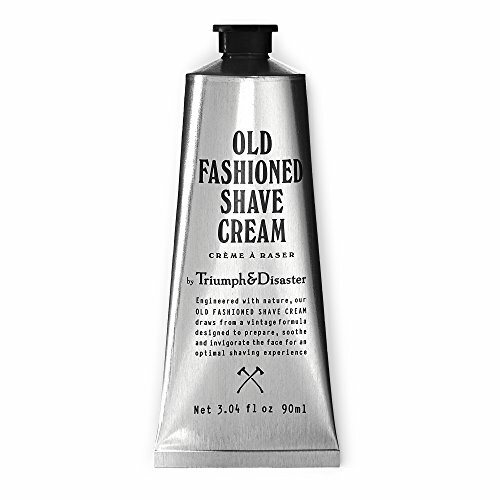 GIVES A CLOSE COMFORTABLE WET SHAVE EXPERIENCE STRAIGHT FROM THE OLD DAYS – Triumph & Disaster Old Fashioned Shave Cream was created to remind us that shaving is a skill passed down from generation to generation and as such, a thing of true value, like a good piece of advice. Give yourself some proper ‘You’ time and enjoy an eclectic wet shave that will leave your skin feeling thoroughly refreshed and hydrated. NATURAL INGREDIENTS WITH ZERO NASTIES – Triumph & Disaster Shave Cream delivers an unbeatable wet shave without the any of the nasties we now frown upon. Rich in natural oils and active agents this best-selling shave cream gives a natural glide on the surface of the skin, producing a crisp clean shave with any style of razor. There are also 90+ shaves in each tube. SOFTENS BRISTLES & PREPARES HAIR FOLLICLES – Our carefully selected expert blend includes coconut oil extracts, organic compounds and fatty acids which together act as surfactants, reducing surface tension and allowing the water and oil components of the cream to combine creating a perfect lather. This action softens bristles and prepares the hair follicles, allowing the blades to glide even closer to the skin and create a super-smooth freshly shaven look, just like in the barber’s chair. EVOKES THE AUTHENTIC FRAGRANCE OF A TRADITIONAL MEN’S BARBERSHOP – Unique aromas of old school medicinal notes, bright, fresh citrus tones and a hint of Turkish barbershop at the back end, evoke a sense of tradition and nostalgia befitting a gentleman’s morning ritual perfectly. PART OF THE HIGHLY-ACCLAIMED TRIUMPH & DISASTER RANGE – Founded on the core principles of sustainability, integrity, and honesty, Triumph & Disaster utilise the best of science combined with the best of nature to produce an eclectic range of the finest naturally-derived yet scientifically-engineered skincare products that are loved by their customers the world over. Visit the Triumph & Disaster Amazon store to view the full range. 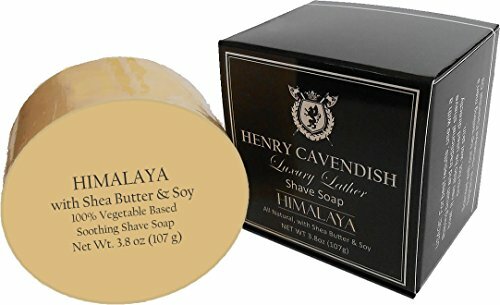 Henry Cavendish Himalaya Shaving Soap with Shea Butter & Coconut Oil. Long Lasting 3.8 oz Puck Refill. Himalaya Fragrance. All Natural Shave Soap. Rich Lather Gives a Smooth Comfortable Shave. For Ladies and Gentlemen. * Top-selling men’s fragrance, Himalaya Perfume Oil. Ladies Love the Addition of Shea Butter which leaves skin feeling smooth and nicely moisturized, not oily. Won’t dry or irritate your skin like many shaving soaps, shaving creams and gels do. Larger in size than average mug shave soaps: will last about 3 – 6 months. 20 seconds in a Microwave fits it to any size shaving mug! • Minimal light scent (almost none) which is fresh without being artificial. Ladies seem to like it! 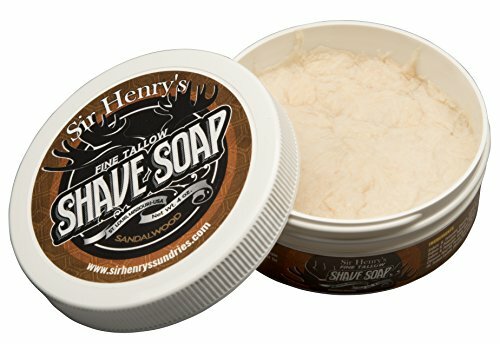 This shaving soap is a notch above other shaving products. With minimal all-natural ingredients, it has no artificial color or fragrance, and contains nothing you can’t pronounce! 100% Satisfaction Money Back Guarantee. Click on the add to cart button, up and to the right on this page, NOW! 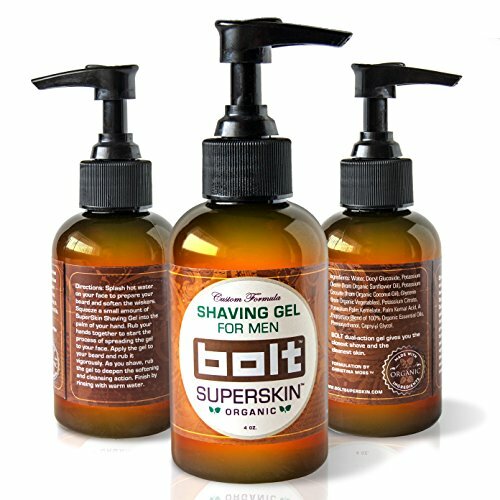 SUPERSKIN SHAVING GEL by BOLT is a dual purpose gel that not only gives you the closest shave but also conditions your skin using a proprietary blend of 100% Organic Essential Oils. For men with sensitive skin, this makes shaving a pleasure and makes razor burn and cuts a thing of then past. Alcohol and chemical free from the start sets Superskin Shaving Gel apart from the rest. 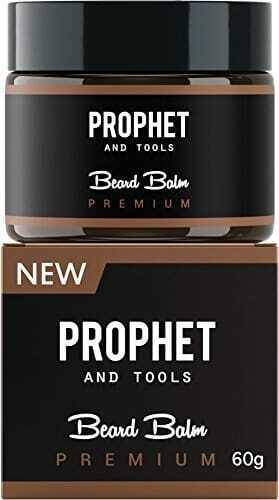 Men with tough beards have had their share of trouble getting a comfortable shave by trying all sorts of items ranging from creams, lathers, brushes, straight razors, razors with multi-blades along with hot towels and having to go to a professional barber for an exceptional shave for that spacial event. Men have to shave. It’s a right of passage. It shouldn’t be torture. Let’s face, men and also women have been searching for that perfect shaving soap or the best shaving cream and have been trying all sorts of remedies from using a shaving brush to electric razors, straight razors and even waxing to handle unwanted hair growth with some success but usually after many attempts leaving battle scars from many of their episodes with “something new”. All for the search to get the best shave that will be consistent and without having to blot blood off the skin during and at the end of the shave. We at BOLT have tried many formulas and have finally created a totally organic gel we proudly call “The best shaving gel for men”. It’s so good, many women are also taking the opportunity to try their significant others Superskin Shaving Gel and finding how well it works when using it to shave their legs. It makes the razor glide effortlessly along the skin enabling a clean and very close shave without any nicks or cuts left in it’s wake. There are many products we also suggest to use after using our shaving gel – Nivea has an excellent post shaving lotion for sensitive skin that also works well and in harmony with our shaving gel. Our Organic Shaving Gel-made for men, but also approved by and for women. ENRICHED WITH A SPECIAL BLEND OF 100% ORGANIC ESSENTIAL OILS. Improves and conditions your skin with Organic Coconut oil. 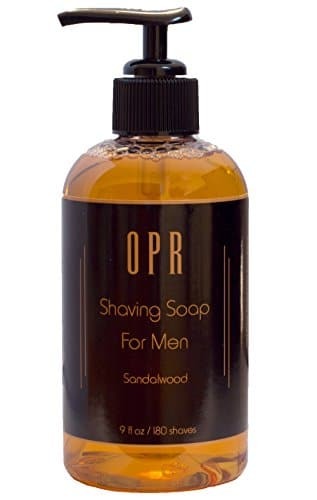 PROVIDES A CLOSE SHAVE AND PROTECTS THE SKIN AGAINST RAZOR CUTS AND BURNS. HYDRATES YOUR SKIN AND LEAVES IT FEELING SMOOTH. IMPROVES RAZOR PERFORMANCE. The gel is very concentrated so a little goes a long way. You can apply it to all areas of your face. Posted in Wet Shave | Tagged 100%, Best, Bolt, Clean, Closest, Concentrated, Conditioning, Enhance, Essential, Experience, Gives, Glide, Goes, Improves, Leaves, little, Long, Oils, Organic, Razor, Sensitive, Shave, Shaving, Skin, Smooth, Supplies, Using, way. 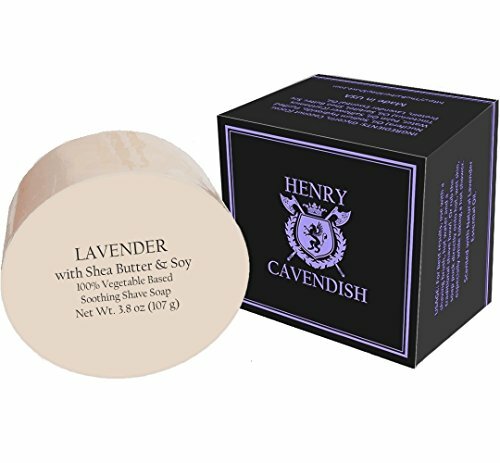 Lavender Shaving Soap with Shea Butter & Coconut Oil. Long Lasting 3.8 oz Puck Refill. All Natural Shave Soap. Rich Lather Gives a Smooth Comfortable Shave. Addition of Shea Butter leaves skin feeling smooth and nicely moisturized, not oily. Won’t dry or irritate your skin like many shaving soaps, shaving creams and gels do. 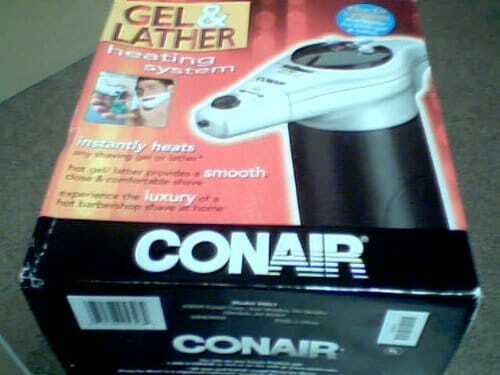 2005 Conair Corp., Conair Gel & Heating System Model Hgl1—instantly Heats Any Shaving Gel or Lather*all Sizes and Brands Except Nivea for Men—hot Gel/lather Provides a Smooth, Close & Comfortable Shave—experience the Luxury of a Hot Barbershop Shave At Home—hot Lather Not Only Gives You One of the Smoothest, Most Comfortable Shaves You’ve Ever Had, but One of the Best: Hot Lather Softens Whiskers so That There’s Less Irritation During Close Shaves, Less Tugging and Pulling, Just a Smooth, Close Comfortable Shave!